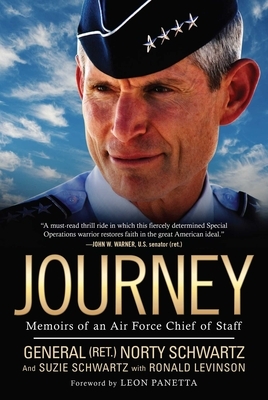 An uncensored account of General Schwartz's term as the wartime US Air Force Chief of Staff under presidents Bush and Obama. Journey is a book about leadership. It is packed with the General’s lessons from life in the military: breaking the mold, flying uncharted airspace, battles?from Iraq to the Pentagon, Afghanistan to Congress. It’s about pushing limits in an era of diminishing budgets and fewer resources to fuel the furnace of innovation. He chronicles the phenomenal story of the evolution of the US special operations, such as what was achieved when taking down Bin Laden. The General discusses the controversial new technologies that have been allowing America to build new capabilities in remote aircraft and cyber warfare. Many believe General Schwartz’s greatest legacy will be the dramatic acceleration of the “drone” program. He is a staunch advocate for it and this book will explain why. General Norton Schwartz served as the 19th Chief of Staff of the US Air Force. As Chief, he served as the senior uniformed Air Force officer responsible for the organization, training, and equipping of 680,000 active-duty, Guard, Reserve and civilian forces. As a member of the Joint Chiefs of Staff, the general functioned as military adviser to the Secretary of Defense, National Security Council, and the President. He lives with his wife Suzie in McLean, Virginia. Suzie Schwartz became a champion for military families and their causes following her early years as a hospitality professional. She currently serves on the Fisher House Foundation Board of Directors and as President, Military Spouse Programs at Victory Media.